The PDF Security library for .NET can be linked into any .NET application, either ASP.NET web sites or Windows Forms applications, to add pdf encryption capabilities to your application. The Winnovative PDF security for .NETcan be used in any type of application to manage the security settings of the PDF documents. You can encrypt the PDF content, add user and owner passwords, control the PDF document permissions for printing, copying, assembling, filling forms, editing content, editing annotations, etc or you can specify the length of the encryption key to 40 or 128 bits, remove all the security settings by providing the user or owner password. If you need a ready to use tool to manage you PDF documents security settings you can use our command line utility. 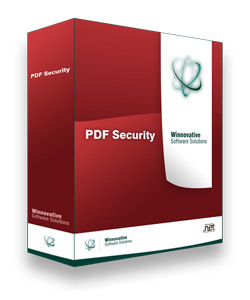 It is a simple application of the PDF security library. The integration is extremely easy and no additional installation is necessary in order to get started. It's just a .NET assembly that you have to reference in your application. Samples are available in the downloaded archive.